During my Mad Men phase a few months ago, I got a 50s-style skirt at a thrift store. It's super fun and bright and happy... but I've only worn it once. Why? Because I never know what to wear it with. Thus, it's just been sitting in my closet for months - even though I really want to put it on! So, this week I forced myself to put some new outfits together (centered around the skirt) by season. Now, I can wear it at least four times a year. Spring: So, I'm super-into mixing colors and patterns right now. 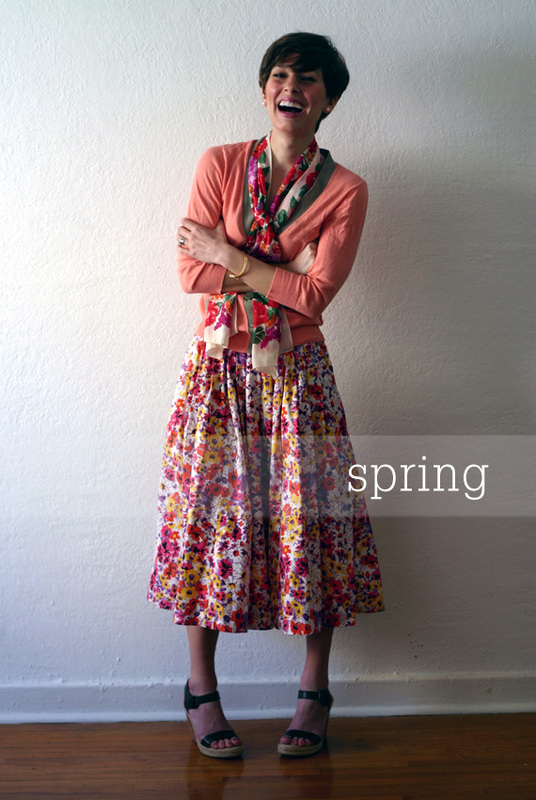 While the color of the sweater isn't technically in the skirt, it's still bright and springy. So, it works without being too matchy-matchy (thanks for that phrase, mom.) I kept my jewelry and accessories simple... there's enough color in this outfit as it is. 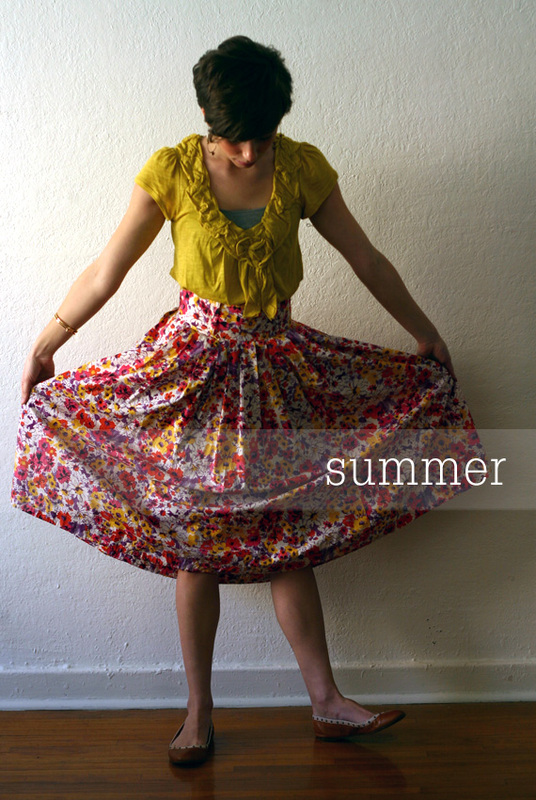 Summer: This is probably my favorite new outfit... it just reminds me of warm evenings, walks by the beach and picnics. My thought process was fairly simple - the color of the t-shirt is in the skirt and the shoes are neutral enough to match with pretty much anything. Done. Autumn: I literally got this jean jacket when I was in Jr. High - and I still wear it all the time (best purchase ever?) I like it here with my new skirt because it's structure contrasts with the skirt's fluidity. I prefer that my shoes match my hair, so it brings people's eyes back up to my face (more about that another time.) Oh, and how rad is this scarf? My parents got it from a gypsy street vendor in the Czech Republic or something. 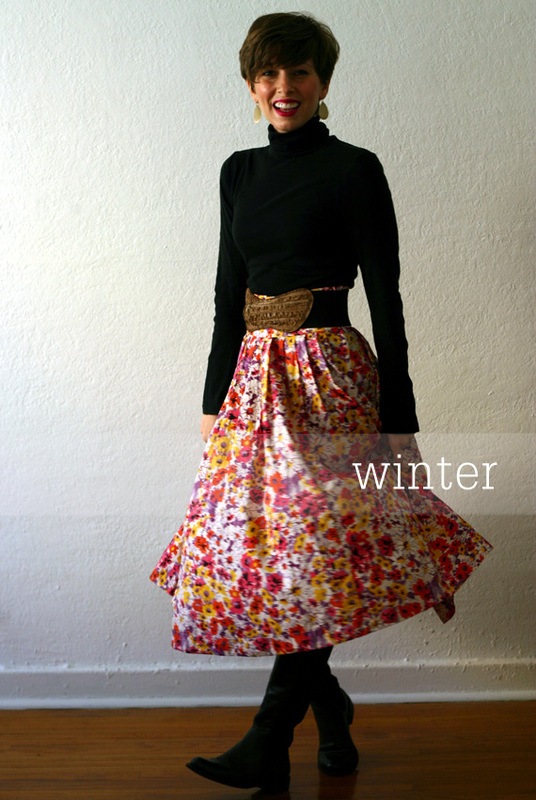 Winter: My mom always said that an all-black/all-brown outfit with one colorful piece was classic. (I mixed the two, since there's both brown and black in the belt and shoes.) Don't want to spend time picking an outfit? Do this. It's easy. Well, that was fun! I probably need to do this more often. I have a few more pieces in my closet that I LOVE, but don't know what to wear them with. Do you? 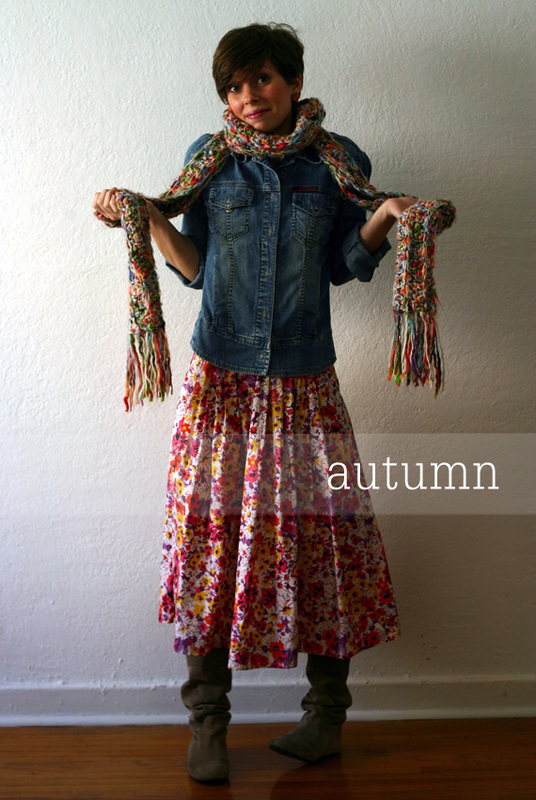 I love the fall and winter ensembles! Great job! You're so creative! Good idea for a post! I like the winter look best actually, maybe cos I love florals and black together. You're right... it is a pretty combination. And, it helps to cheer up those dreary winter days!